Here is a message from Lou Anna K. Simon, the President of the University — what a year it was! The year 2010 was one of extraordinary achievements and epic adventures at Michigan State University. While nearly half a million Spartans live and work in countries spanning the globe, when we have something to celebrate we do so in solidarity. And so I invite you to view a video of MSU milestones from 2010 that was featured in the recently launched President’s Report for 2010. What a year it was—from groundbreaking discoveries that will make a difference in communities near and far to groundbreaking events for facilities that promise to transform the physical, educational, and cultural landscapes of MSU. Not to mention the heroic victories of our Spartan athletics teams. Please enjoy this look back at 2010 and share it with friends and family. Go Green! Have you ever noticed how there are some foods that just always taste good? These are what I call the comfort foods . . . the foods I grew up with . . . the foods that Mom used to make (and of course, no one makes them as good as Mom did). Spaghetti was one of these meals — a meal that was equally delicious as a leftover — and Mom’s sauce was pretty darn good (despite its simplicity). So I whipped up a batch of Mom’s “Everyday Spaghetti Sauce” last night for today’s dinner (Mom even wrote on the recipe: “Sauce is best when prepared ahead and refrigerated.” Who am I to argue with Mom?). Now all I have to do is reheat the sauce, throw together a salad (I’m thinking about a quick Caesar Salad), prepare the pasta, and bake up some garlic cheese toast and dinner will be ready! Is it time for dinner yet? Yum! 1 pound of ground beef and 1/2 a cup of onion. 6-12 ounces of tomato paste. 1/8 teaspoon of pepper, garlic powder, and Parmesan cheese. Cook over medium heat for an hour (uncovered). Seasonings can be increased to taste. Cook for an additional 30 minutes to an hour. Cool, and refrigerate. Reheat and serve over pasta (this is enough sauce for 16 ounces of spaghetti). I’ve adapted Mom’s recipe a bit by adding some Italian sausage, diced green pepper, and bay leaves . . .
To gain the mental edge for positive performance, you must have the ability to keep your composure in pressure situations. As pressure increases, the need for mental strength/mental toughness increases. Keeping one’s composure is a mental skill that should not be overlooked. Even if you have superior tactical, technical, and physical skills you can experience negative performance if you are anxious, nervous, and lack internal control in those pressure situations. There is a physiological component as well since performance is very much a mind-body connection. Nervousness leads to muscle tension and tightness which are certainly performance limiting factors. And, while this concept is generally applied to athletic performance, it can be equally important in any of life’s challenging situations. Here’s a wonderful demotivator (courtesy of www.despair.com) to further reinforce this idea. March Madness has certainly lived up to its billing this year, and the Road to the Final Four is now complete. The four remaining teams: Connecticut (3), Butler (8), Virginia Commonwealth (11), and Kentucky (4). For the first time since the seeding of team began, there are no #1 or #2 seeds in the Final Four! It has been a wonderful weekend of college basketball. Next weekend . . . the Final Four from Houston. And, the way the brackets shape up, we’re guaranteed of having a Cinderella in the Championship Final (Butler faces Virginia Commonwealth in one of the semis with Kentucky and UConn in the other). Congratulations and good luck to all of the teams. singing in which the singer substitutes improvised nonsense syllables for the words of a song, and tries to sound and phrase like a musical instrument. The Road to $1 Million! According to a recent article that I read, reaching the seven-figure mark (savings/retirement) is easier than you may think. But if this is the case, then why do only about 7% of American households ever reach this mark? The three keys to success: 1) the amount of time you allow, 2) the amount you save per year, and 3) how you invest (mix of stocks and bonds, aggressive or conservative investing, etc.). The real key is to get started as early as possible in your career (but also realize that it is never too late to start . . . you just make it more difficult to hit the mark the longer you delay). Here are some fun “millionaire” facts . . .
– 14% say their parents are wealthy. – 90% are college grads. – Only 5% have law degrees. – Only 3% went to medical school. – One in six millionaires is single. – 61% say they still have a lot to learn about investing. – $31,400 is the median price of a millionaire’s car. – States with the highest percentage of millionaires: AK, CA, VA, DC, MD, NJ, CT, MA, NH. – States with the lowest percentage of millionaires: ND, SD, OK, AR, LA, MS, AL, TN, KY, WV. – The amount that millionaires save or invest annually: $39,300. – Warren Buffett earned his first million by age 31 — this represents .002% of his current fortune. – 42% say they do not feel wealthy. – The buying power of $1 million today’s dollars: $744,100 in 2021, $553,700 in 2031, $412,00 in 2041. – $1 million was the “ransom” asked for in the 1971 version of the movie The Taking of Pelham One Two Three. $10 million was the amount asked for in the 2009 remake. – 3,936 pounds of osetra caviar you could purchase with $1 million in 1984; 324 pounds you could buy today. Food for thought. So, how far along the way are you? 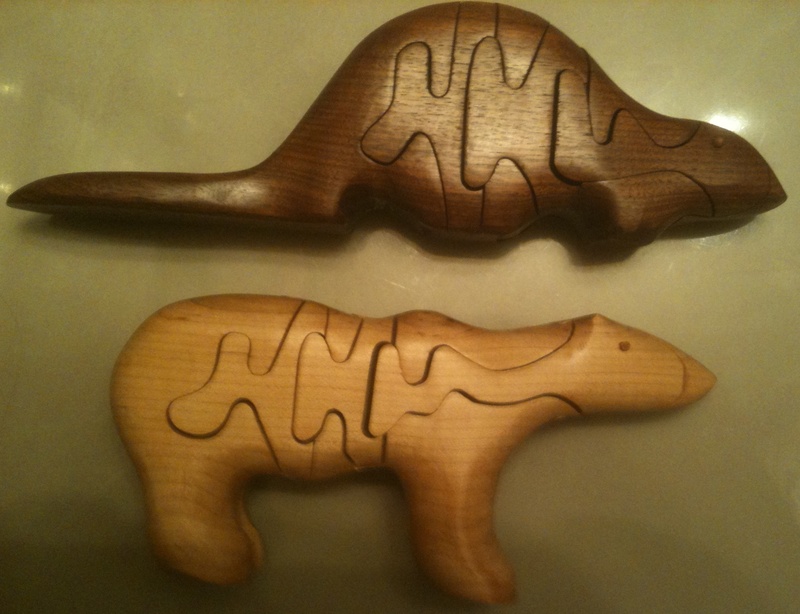 These unique three-dimensional wooden puzzles (a beaver carved out of mahogany and a polar bear carved out of pine) are sensational works of art (in my humble opinion). I acquired them several years ago during one of my Alaskan cruises (from one of the shops in Vancouver, I believe). What makes these beautiful puzzles even more unique is the fact that all that holds them together is a small wooden pick that serves as the “eyes” of each animal. The artist’s last name is Evans. Unfortunately I do not know their first name, nor do I remember the name of the shop where I acquired them, but I will certainly keep looking to acquire more of these clever puzzles next time I’m back in Vancouver. Nature . . . a Constant Wonder! Nature is full of wonders. I’ve heard of, but not yet witnessed a “red tide,” but they sound positively fascinating. Red tides (also known as algal blooms) are sudden influxes of massive amounts of colored single-cell algae that can convert entire areas of an ocean or beach into a blood red color. Some red tides are associated with the production of natural toxins and can be considered harmful; depletion of dissolved oxygen or other harmful effects can create wildlife mortalities among marine and coastal species of fish, birds, marine mammals, and other organisms. While no human deaths have been attributed to “red tides,” people may experience respiratory irritation if the red tide organism’s toxin gets blown to shore (aerosol) and consumption of contaminated oysters or shellfish could lead to serious illness. Swimming is usually safe, but if the concentration is high enough, you could experience skin irritation and burning. This phenomenon reminds me of a movie quotation from the Fugitive: “If Chicago can dye the river green on St. Patrick’s Day, then why can’t they make it blue the rest of the year?” He raises an excellent point, but at the same time, it’s just not natural. And it is certainly not as “natural” as nature’s red tides. The season has ended for the Michigan State Women’s basketball team as well. The Lady Spartans (#4 seed) were unable to get past the University of Wisconsin Green Bay (#5 seed) in their bid to reach the Sweet Sixteen. The Spartans never led in the game due in part to excessive turnovers by the Spartans coupled with exceptional outside shooting on the part of Green Bay. Congratulations to UW-Green Bay! If you are looking for a quick and easy dessert (pan cookies), your looking is over. These were one of my favorites, but be careful, they are addictive. Combine sugar and syrup in a large kettle (3 quart). Cook over moderate heat stirring frequently until mixture boils. Remove from heat and stir in the peanut butter until blended. Add the the Rice Krispies and stir until they are coated. Press mixture into a buttered 13 x 9 pan. Melt both flavors of chips in a double boiler (keep the water hot, but not boiling). Mix well and spread over the top of the Rice Krispie mixture. Cool, cut into bars, and enjoy!